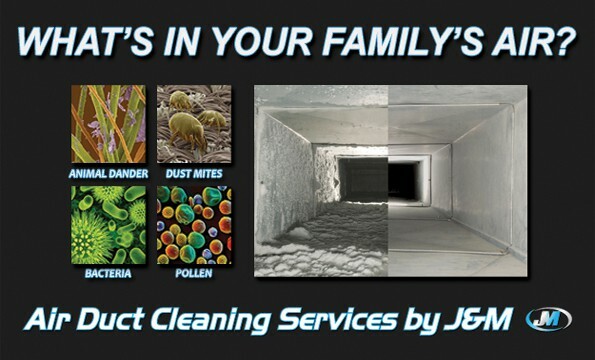 Of all the Air Duct Cleaning Camas Washington Contractors available, why should you choose J&M Services? We’re local and we truly care about our community. We’ve been involved in many local non-profit organizations including local little league teams & community parks. Don’t get ripped off by hiring a random company advertising as an Air Duct Cleaning Camas company whose main office is actually located in Seattle. Stick with a local and reputable HVAC duct cleaning company in Camas that truly lives & breathes our unique Pacific NW conditions. We have always prided ourselves on being a family owned local company and being a big part of our local community. We honestly care about the well being of our amazing Air Duct Cleaning Camas Technicians and the families they go home to every night. We guarantee you will easily see the difference yourself in the attitude & respect towards our customers, and the attention to detail from our skilled Duct Cleaning Technicians. To this day, I personally chat with all of my amazing Duct Cleaner Tech’s each and every morning prior to beginning the work day. I am truly proud of each and every one of our J&M Camas WA Air Duct Cleaning Services Family, and it shows where it counts, in your home! 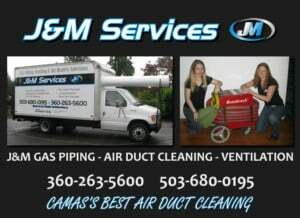 J&M Services, Your Local Camas Air Duct Cleaning Specialists! I encourage you to do even a quick Internet search for Camas WA Air Duct Cleaning Contractors, I think the 5 star reviews from our literally 100’s of happy duct cleaning clients will speak for themselves! As I’m sure you have no doubt come to the conclusion that there are several different methods being used for air duct cleaning in Camas Washington, after decades of testing & using the various vent cleaning methods & equipment, we have outfitted each of our duct cleaning vans with high powered modern portable duct cleaning machines that each have FOUR vacuum motors and assortment of specialized HVAC brushes made to fit every size of ducting in your home. We’ve also seen tons of different pricing methods, including many air duct cleaning companies in Camas WA using “sneaky” set up fees and “hidden fees” that often aren’t mentioned until after the air duct cleaning job has already been completed and the final invoice is handed to you. Why would there ever be hidden fees or extra charges without prior approval? We believe in keeping our duct cleaning pricing as simple & easy to understand as possible! We ask that you count all the HVAC supply & return air vents in your house, and then simply give us a call for a quick and easy to understand firm estimate. As mentioned before, we utilize powerful FOUR motor portable systems for our Camas WA air duct cleaning services. Portable systems allow us to fully access all of your homes heating duct work, and are much less intrusive than obsolete truck systems. Modern portable duct cleaning equipment also requires less maintenance & overhead repair cost VS the old truck mounted systems, allowing us to offer very competitive pricing to our valued Camas Duct Cleaning Customers! J&M Air Duct Cleaning Services is Your Camas Air Duct Cleaning Specialist! What makes us the obvious choice for the premier Camas WA air duct cleaning specialist, and how does this benefit you? For starters, we have an extensive background in HVAC duct work & ventilation. We are proud to be your Camas WA air duct cleaning specialists. However, we are also proud to be trained & certified in all types of heating duct work & ventilation. Our extensive training in ductwork & ventilation means we understand each individual homes complex heating ducting system, and can even make minor repairs while onsite during your duct cleaning appointment. We have the knowledge to advise and/or bid larger or more complicated ducting issues found during your air duct cleaning service that a lesser trained Camas WA air duct cleaning Technician wouldn’t notice. Trust your homes expensive HVAC ducting system to the tried & true local pro’s at J&M Services! Air Duct Cleaning Camas Wa Services, when and how often should I have my HVAC ducts cleaned, and what is involved? J&M Camas WA Air Duct Cleaning Service likes to give our clients some helpful & informative information to assist for deciding when to get your homes HVAC ducting system cleaned. So when should you have your HVAC ducting cleaned, and it is actually necessary? If you’re just moving into your new home, and you really don’t know much about how the previous owner lived or cared for the home, or if the previous occupants ever had the air ducts cleaned, don’t live with someone else’s dirt, skin flakes, pet dander, bacteria, and who knows what else! If you have cats or dogs or even smaller furry friends, live on a dusty gravel road, have rowdy younger kiddo’s (or older) at home who constantly track in dirt & debris, or any other instances where dirt & debris could be entering the HVAC ducting system, you may consider increasing the frequency of your HVAC duct cleaning intervals. Anytime you’ve gone thru a remodel or perhaps a new addition to the home, having your ducts cleaned is always recommended. J&M Camas WA Air Duct Cleaning Services utilizes soft bristled brushes sized specifically for the individual heating ducts to knock loose dirt & debris from the walls of the ductwork without ever worrying about causing damage to the inner liner of flexible HVAC ducting, followed by a large diameter vacuum hose powered by FOUR oversized vac motors. High Micron Rated HEPA filters ensure the harmful allergens & debris are contained within our portable machines and are not released back into the interior air stream. Customers have frequently told us they experience much less dust on furniture thru-out their house, many clients have mentioned greatly reduced or even completely eliminated allergy symptoms (Yay! ), clean HVAC system components & filters and a noticeable overall improvement in indoor air quality after a high quality Camas WA air duct cleaning service. Please like us on Facebook and follow our page for more special HVAC Duct Cleaning offers!